Until this Sunday only, there is a small exhibition of 14 works by the eminent English watercolourist, David Cox (1783 – 1859). The works are from the Stirling Smith’s own collection, and are part of the bequest of the founder, Thomas Stuart Smith. The exhibition is curated by intern Annika Thielen, the Museum Studies student from Leipzig who is with the Smith for 5 months. The works have not been on show for 50 years, and like Turner’s watercolours in the National Gallery, they are in show for January only. Cox was one of the great masters whose late works rank alongside Turner, Constable and Boudin for their impressionistic methods. He was born in Birmingham and worked in his father’s smithy. During a period of recuperation when he broke his leg, he was given a box of paints and his artistic talents were discovered. Aged 16, he became apprenticed to a locket maker, painting miniature portraits, then became a scene painter at a Birmingham theatre. In 1804 Cox moved to London and established a teaching practice. 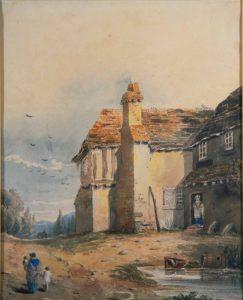 In 1814 he published a ‘Treatise on Landscape Painting and Effect in Watercolour’ followed by other works. Stirling is fortunate to have a collection of works by this great artist. Don’t miss the chance of seeing them.